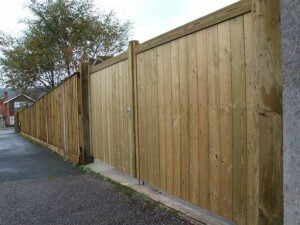 Windsor Entrance Gate - Blamphayne Sawmills Ltd.
With its straight top rail this gate is both strong and secure. Very similar in design to the Balmoral, made with top quality Scandinavian Redwood. Planed all round, with TGV cladding in a rebated ex100mm x 75mm frame. Standard sizes range from 0.9m (3’) to 1.8m (6′) per leaf. Available in both Hardwood & Pressure treated Softwood.